How Much Is Too Much Space Junk? The human species has a prodigious power to litter, but the popular belief has been that the sheer enormousness of space prevents humans from doing too much damage. That's true enough  or at least it would be if we traveled throughout the entirety of the cosmos. But the fact is, the vast majority of our space exploration amounts to little more than wading offshore. The shuttle orbits at about 220 miles; the International Space Station stays at 270 miles. Our highest-flying satellites hang in space at about 22,000 miles  which sounds like a lot until you realize that still gets you only one-tenth of the way to the moon. The two ships that just collided are sources of a whole lot of potential new junk. The American craft  one of 65 communications satellites in an orbital flock known as Iridium  weighed 1,235 lb. The Russian craft, a now defunct satellite launched in 1993, weighed a ton. "I think we will almost certainly see hundreds if not thousands of pieces of tracked debris," says Mark Matney, an orbital-debris scientist at NASA's Johnson Space Center. "It all depends on how efficient the impact was. Was it a glancing blow or a full body hit?" 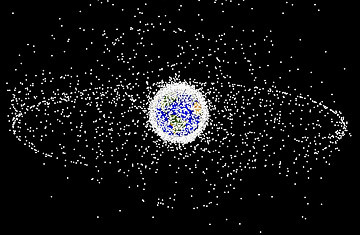 A consortium of government organizations including NASA, NORAD and even the FCC keeps track of all the planet's high-flying rubbish, and so far, its running count is flat-out scary. There are currently at least 17,000 objects measuring 4 in. or greater circling the Earth  and in some ways, that's the good news. The government estimates that there are 200,000 objects in the 1-in.-to-3-in. range and tens of millions smaller than an inch. And if you think those tiny pieces of junk can't do much harm, think again. According to a back-of-the-envelope rule the Apollo astronauts used, given the speeds involved in traveling in low-Earth orbit, a one-tenth-in. bit of chaff would collide with an oncoming spacecraft with as much force as a bowling ball traveling 60 m.p.h.